A teacher friend whose DIY-bent husband decided to get into homebrewing invited us out to their place today. Their house/location is probably worth its own post sometime, but tonight we went out to homebrew some beer. B.B. brewed some wine last week that's been fermenting in their garage, but this was his first shot at an ale - it's a Xmas present to a buddy at work so I hope it turns out. Propane tank wired to a metal stand they use to fry turkeys on Thanksgiving. You heard me. Fry turkeys. On top of the metal frame is a detached keg: the top has been cut out and a spigot retrofitted on the left side in the picture below. The mash: In this brew kettle we first brought 2 gal. of water and brew salts to shy of a boil, throwing in a muslin grain bag with a mixture of Vienna, pale malt, and roasted barley for a 20 min. mash. After draining the grain bag, BB added a several-cup container of malt extract - a syrupy mixture that looks like honey and smells like raw wheat. After 55 minutes of slow boiling, the wort was stirred for five minutes before being cooled over 2 gal. of ice that melts into the wort, and then topped off to 5 gallon with cool water. Once the mixture was at the right cool temperature, it was transferred to this 6-gal. glass carboy, and the yeast (which had been activated approximately 3 hours prior) was pitched. The glass stopper admits gas into its chamber without releasing moisture. If all goes right, this Irish red ale will ferment for 7-12 days in a 66-68 degree environment, and be ready for bottling/sampling in two weeks. This was my first brew day, and it was a lot of fun. Our apartment/environs leave a lot to be desired for homebrewing, so I plan on pursuing this hobby vicariously through BB. Fortunately, he seems to be in a thrall quite the same as mine - indeed, plans are set for a Honey Brown ale brewing next week. We've got two blobbers in the house again. Check out Miss Bee's for a frittata recipe she made from farm fresh eggs tonight...and stay tuned, she just might be back! This little penguin belongs to a teacher at school. The annual Monster March at Ball-and-Chain Elementary - behold Mr. Sikkink, err, Principal Sikkink in his suit! 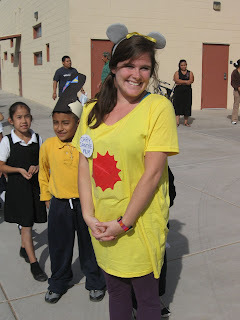 Behold Miss Bee, err, Chrysanthemum the Mouse in her sunniest dress! Miss Bee Goes to Sports! Miss Bee had not been to a professional sports contest that was not baseball before we went to the USAirways Center with the student council to watch the Suns battle the Golden State Chargers (she meant "Warriors"). Explaining the finer points of the game to a kindred non-sporting spirit. An unusual piece of headwear elicits an unusual look. We were in the nosebleed section, but the kids had fun. Look out for some Halloween Monster March pictures coming soon.